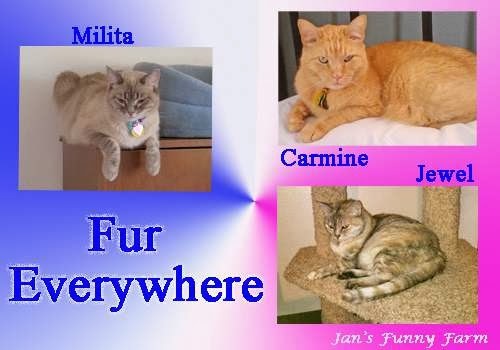 Fur Everywhere's Mission: To inform and entertain cat owners and lovers. After having graduated from DePauw University in 2004 with my BA in Psychology and minor in Religious Studies, I moved to Colorado to pursue my Master's in Social Work. During my second year of graduate school, I developed a chronic pain condition and had to rethink my career goals. That's when I decided to hone in on my writing talent. 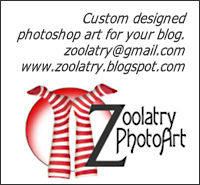 I became a freelance writer and professional blogger in 2006 and have loved every minute of it! 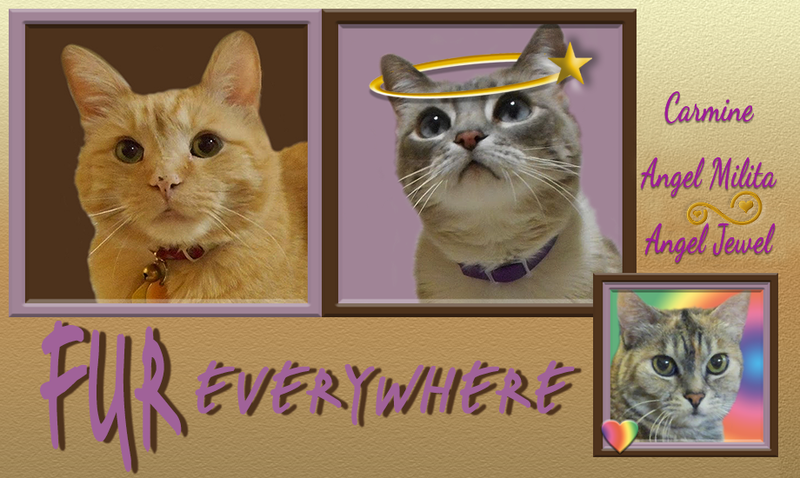 I launched Fur Everywhere to entertain and inform cat lovers and owners. Not only did I want to share my own experiences with other cat people, I wanted to educate cat owners on the best ways to care for their beloved companions. 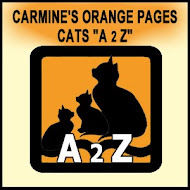 I regularly provide educational posts on cat health and behavior concerns as well as breed profiles, cat news items, and book and product reviews. I've had the pleasure of working with several pet companies, including Royal Canin, PetSafe, Pet Naturals, Chewy, PetBox, and the Natural Pet Company. You can visit the Reviews & Giveaways page to see my past product reviews, giveaways, and sponsored posts. Please visit my PR Friendly page to see a list of all of my services or contact me with inquiries. I am very passionate about finding cats loving forever homes, and I feature an adoptable cat each week on this blog. I like to feature special needs and senior kitties most often because they are considered by some to be "less adoptable." Personally, I believe special needs and senior cats make some of the very best companions! I also volunteer my time with a local cat shelter. 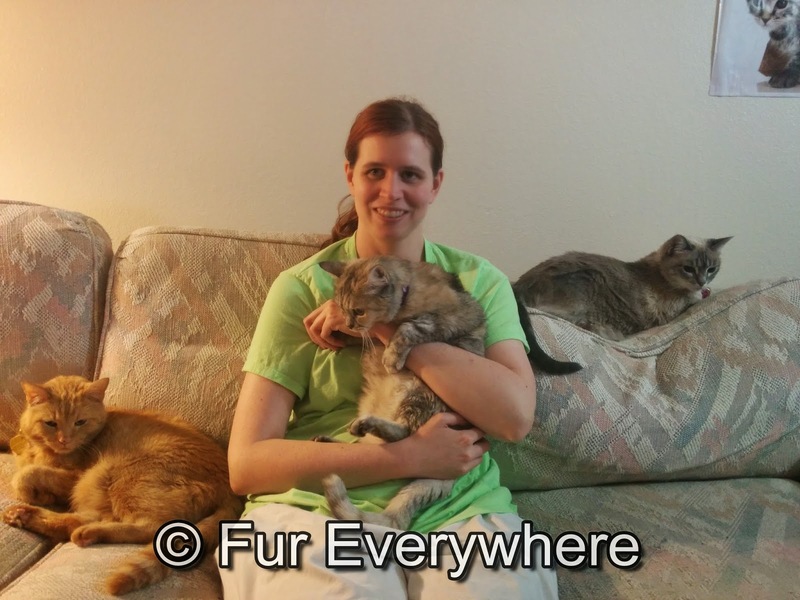 I socialize the shelter's adoptable cats and write the organization's blog posts as well. I met my human when I came to live with my human's father. The man who had owned me and my five brothers and sisters didn't have room for us in his home, so he gave us to our human's dad who cared for us. I saw my human when she came home from college for breaks. She was always nice to all of us and spent time petting us. I always wanted ALL of the petting and attention, and I would push my brothers and sisters out of the way so she could only pet ME. My human became my mommy when she moved from Indiana to Colorado to attend graduate school. My mommy's dad suggested she pick me because I was the friendliest kitty in my litter! So mommy took me with her. I have been living with my human for years now, and I love her very much. Mommy gives me lots of hugs and pets everyday, and I just love all of the attention! When mommy goes to sleep, I curl up on her pillow to be near her. I love to play with my catnip mice and Neko fly, chase the laser pointer around, and steal mommy's chair when she's not in it. I am a lynx-point Siamese mix, and I think I am very beautiful (and mommy says so, too)! I was only a kitten when I found my human. I was sitting in a cage at a PetSmart adoption center when my mommy came to look at me. She got someone to let me out of my cage and sat down with me in her arms. I curled up in her lap and made sure she knew that I wanted HER to be my human! Mommy said she would come back to get me tomorrow when she was approved to take me home. I was sad when she left, but the next day she came back like she promised and took me to my forever home! 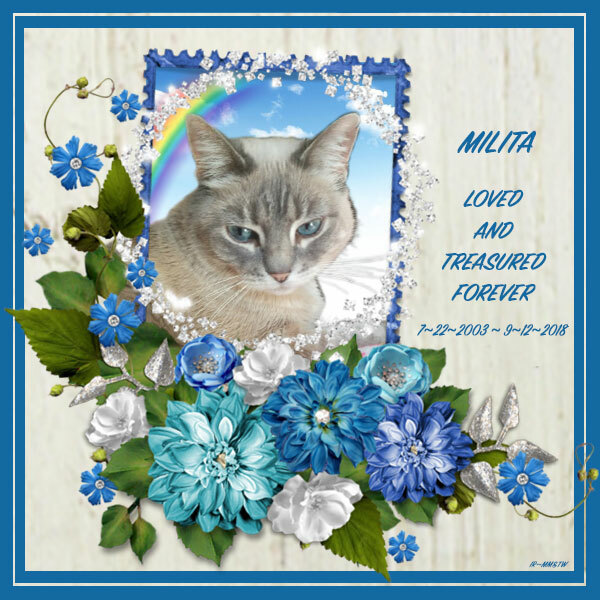 I was really excited to be in my home, but Milita really didn't like me, and that made me a little sad. I just wanted her to play with me. I love to be in the same room as my mommy. I spend a lot of time in my pink kitty kube, which mommy got us one Christmas. It is one of my favorite spots to nap. I also love to play with catnip toys and fishing pole toys. I am a very sensitive, cat and I always seem to know when mommy needs some extra purrs. I have Feline Lower Urinary Tract Disease and arthritis, but mommy always makes sure I have exactly what I need to stay healthy and pain-free. I think Milita and I are very lucky to have a mommy who loves us so much! My story is a little complicated, but I came here after I got sick with chronic renal failure. I need a lot of care, and my former owner wasn't able to keep up with it with his long work hours, so I came to live with the Mom. The Mom takes very good care of me, and I feel lucky to have her. I really love catnip and treats! I also love napping in my kitty kube. I always know when it is the human's dinnertime and demand a bite of whatever meat she is eating. I especially love beef, hot dogs, and chicken. I love to be near the human while she goes about her daily activities. 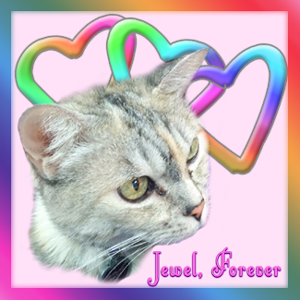 Precious Jewel passed away on August 28, 2014. We miss her dearly and think of her daily. She will forever be in our hearts. We love you, Jewel! I have enjoyed your blog!! I am so sorry about your illness. Cats are just the right pets for you. I have had dogs and cats but my last dog I adopted I had only just over 10 months. She jumped the 6 ft fence and got killed in the road and I said no more dogs now only cats. I have 3 cats!! You have been nominated for "The Field of Flowers". 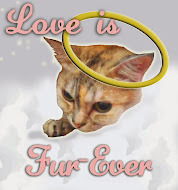 Please visit http://thekittycorner.wordpress.com/2014/03/02/the-field-of-flowers-award to accept your award! I just stumbled upon your blog and I love it. I understand your love for your fur babies as I feel the same way about mine. Thank you for the cat's back stories...they sure found a FAB Mum in you!!! I am sorry Jewel went to Summerland....I KNOW how hard it is to say Goodbye! Carmine is so adorable...there is something whimsical about him. Thanks so much for finding our blog and following us. Mom says she lets us keep our blog going so she can keep her writing skills tuned as well. We tell her what to write and she sort of translates. MOL!!! Very nice to meet you and your fur people. We love making new friends and so does Mom!